I have recently been working hard on developing a collection of Geometric Gridded Sketchbooks. As an artist I am often asked how do I create my patterns? And it’s actually not as difficult as you might think. I use a selection of gridded papers allowing me to plot my patterns. I have created two different sketchbooks using the most used grid systems in my daily practice. First up, I have Polar Graph Sketchbooks. 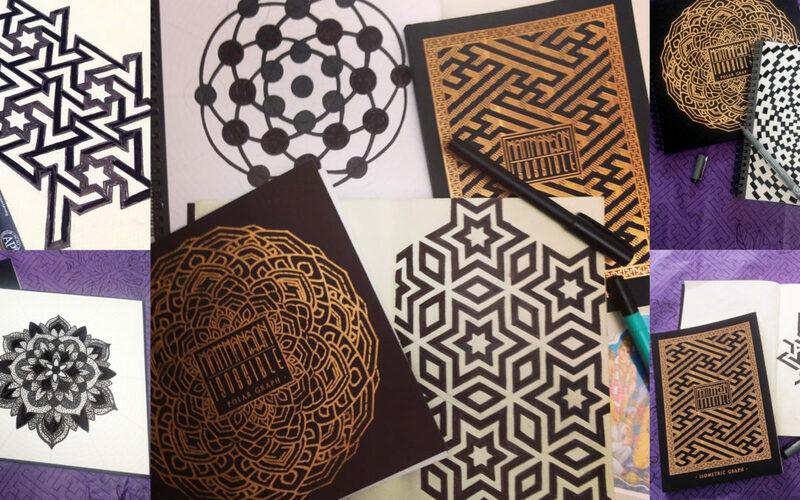 The Polar Graph Sketchbooks are the perfect tool for drawing mandalas. The sketchbooks are 21 cm squared with a 480gsm sirio black and gold embossed cover. Inside you have 40 pages of 200gsm white isometric paper held together with ring binding allowing the sketchbooks to lie flat when drawing. along side my polar graph sketchbooks i have also developed a Isometric Graph Sketchbooks. The Isometric Graph Sketchbooks can be used for drawing cubic patterns and other isometric designs. The sketchbooks are A5 with a 260gsm sirio black and gold embossed cover. Inside you have 160 pages of 80gsm cream isometric paper held together with a perfectly bound cover.